The secret to a fantastic, relaxing facial is the special oils used by the therapist. Rika Tazumi, who’s been perfecting facials during seven years in business, believes four types of facial oils are essential to treatments, including several essential oils blended for certain skin conditions. Tazumi owns and operates Inca Aroma Healing Studio, where she specializes in facial treatments. Three of Rika’s favorites are ‘Ocean for dry skin’, ‘Sky for oily skin’, and ‘Sun for sensitive skin’. All contain Getto and Iju oils extracted from Okinawa herbs. Another oil used in Inca Aroma Healing Studio’s treatments is Rose Otto, based on an essential oil that serves the anti-aging process and clears troubled skin. A facial at Inca Aroma Healing Studio is an experience that relaxes both mind and body. Pores are first opened with a steam cleansing to rid the face of particles before Rika performs a massage using aroma oil, the exquisite touch tracing up the nose ridge, then around the eyes in a gentle semicircle. A Cray pack is applied after the massage, moisturizing the face while the fragrant aroma infuses a touch of synergy that stimulates blood circulation. Finally, the floral water facial soak, ideal for the person with wrinkles or dark rings under the eyes. All that, Rika explains, for only ¥3,000. What drives Rika? “I just want to see people smiling,” she demurely smiles herself. Treatments are available both at Inca Aroma Healing Studio, and with house calls. All treatments are by appointment only. The aroma therapy facial treatments are ¥3,000, while therapeutic body oil massages range from ¥3,000 for a half-hour to ¥5,000 for an hour, or ¥7,000 for 90 minutes. There’s a ¥1,000 discount when a client takes both a facial and a body massage. 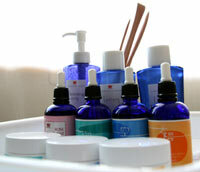 Inca Aroma Healing Studio also offers essential oils, floral water, Cray pack and other products for home use. Chamomile, Lavender and Rose floral waters are ¥1,000 for 100ml bottles. Genuine aroma essential oils are also available for ¥1,000. A Cray pack sells for ¥650. Inca is open daily 10 a.m. to 7 p.m. For more information call 098-892-9006 or 090-1080-0729. Inca Aroma Healing Studio is located near Futenma Housing. Take Highway 58 to Route 81, heading toward the Camp Foster PX Gate. Inca’s halfway between Highway 58 and the gate. Look for a sign for Italian restaurant Pao. Once Pao is spotted, the red Inca sign is easy to see. Inca is located on the third floor ofTaihei Building.